8 Complete Martial Arts Taught as ONE! The main emphasis of Moo Doe training is to develop and strengthen the individual mind and body. The Oom Yung Doe line of martial art training incorporates movements from eight different martial art styles for complete mental and physical development. Four different regions of China (North, South, East and West) have different terrain and climactic conditions which have influenced martial arts practitioners to adjust their practice to more fully benefit from nature's phenomena. In Eastern China, practitioners took advantage of their closeness to the ocean to develop forms such as Tang Non, Tang Non Choy Yo, Sa Chung and Su Chung that took advantage of the movements of the ocean, water and sand. These movements were often practiced in the sand. In Western China the terrain is mountainous. Martial arts movements developed here resemble the movements of the native animals. Practitioners also used herbs found in the mountains to aid and enhance the body. 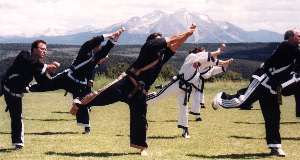 Some of the forms developed were Kom Gong Quan, Kyung Gong Sul Bope, Kway Dae Quan, Chul Sa Chung, Sok Chung, Mae Wha Kom, Kom and Chung Yun Doe. In Northern China the climate is cold. To stimulate the circulation and build external body strength, movements and forms developed speed. Some forms include Dok Sa, Pal Yung Su, Way Chung, San Chung, Yung Ma and Chi Chung as well as movements derived from birds of prey. In Southern China the climate is warm. The forms developed were slow and concentrated on breathing to build internal strength. 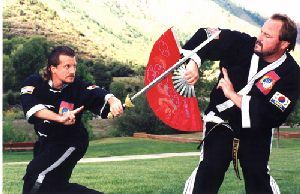 Some forms developed were Tai Chi Chung, Hym Yok, QiGong breathing, Chung Sul and Sam Chok Chu Chuk Bong. Over the centuries throughout the world, billions of people have utilized the practice of Moo Doe, the core of Martial Arts knowledge, to benefit their daily lives. 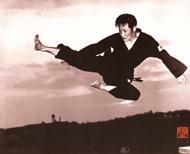 Oom Yung Doe combines knowledge, forms and movements practiced, studied and refined by generations of Martial Art practitioners over thousands of years into a unique, diverse style of martial arts today. This diversity benefits and develops the human body in many different ways unique to the Oom Yung Doe Martial Arts, one of the few schools to combine and teach all 8 main Martial Arts together as one. Each of the links above leads to a brief description of each of the eight Martial Arts.